Our Made for You wedding flower package includes gorgeous, ready made fresh flower Boutonnieres and Corsages. Choose your own combination between boutonnieres, pin-ons, or wrist corsages. Each Touch of Sun piece is perfectly decorated by hand and made especially for you. 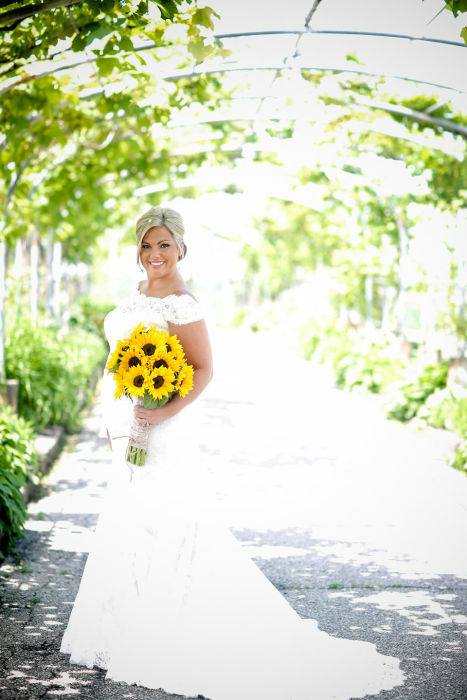 This spectacular wedding collection features golden sunflower daisies accented by baby eucalyptus greenery. Not only are they for your wedding party, but they can also be used for decorating; for example, strap them to your cake cutter or to a candelabra. This product is only available in the USA. • Need the flowers before the first date available on the calendar? Call our customer service team at 877.50.ROSES (507-6737) to speak with a representative about rush delivery. Additional charges may apply. • This boutonniere and corsage package contains a total of 16 to 30 pieces. 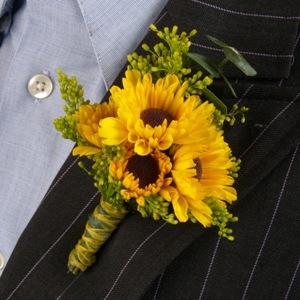 You may choose a combination of boutonnieres, pin on corsages, and wrist corsages. 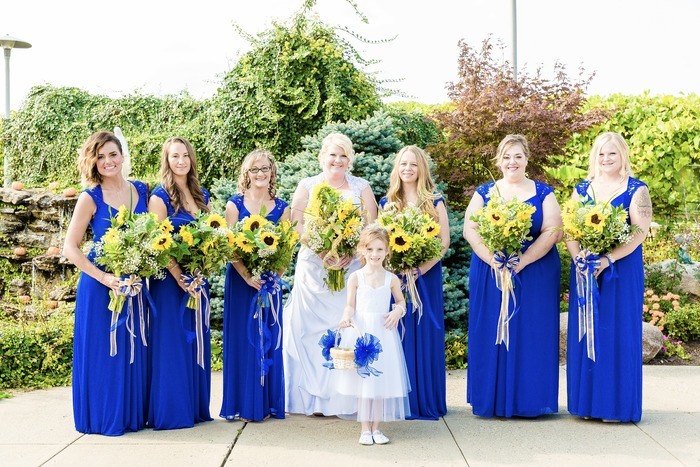 • Each boutonniere features 1 spray Novelty Viking Daisy set against Baby Blue Eucalyptus, 1 shoot of Solidago Asters, and wrapped together with yellow tulle ribbon. White headed pins included. 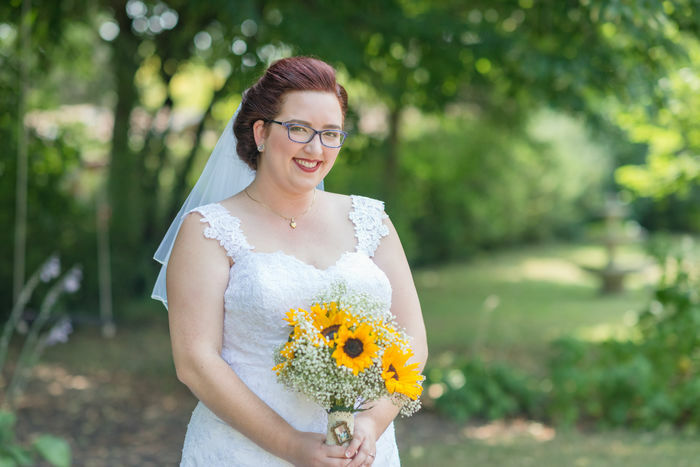 • Each pin-on corsage features 2 spray Novelty Viking Daisies set against Baby Blue Eucalyptus, 1 shoot of Solidago Asters, and wrapped together with yellow tulle ribbon. White headed pins included. • Each wrist corsage features 2 spray Novelty Viking Daisies set against Baby Blue Eucalyptus, 1 shoot of Solidago Asters, and wrapped together with yellow tulle ribbon. Wristlet included. 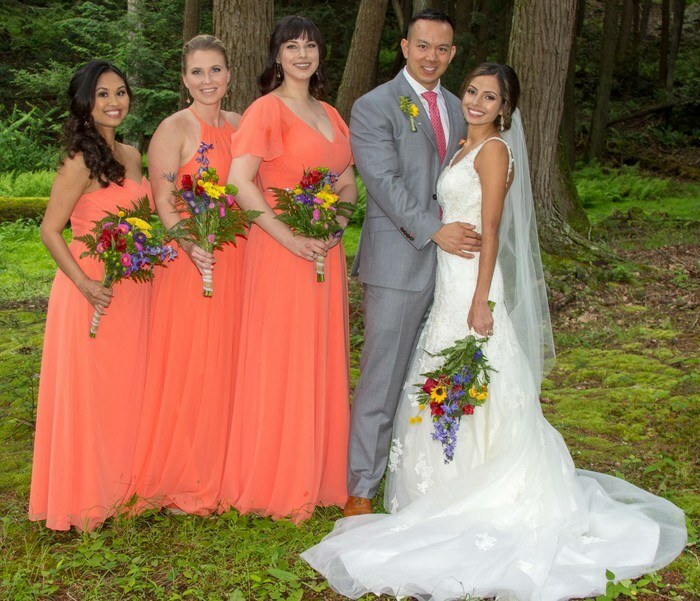 • The average length of a boutonniere and corsage is 5 inches. • Shipped fresh from our Colombian partner flower farms. • Due to variation in monitor resolutions, the exact colors of these flowers may vary to some degree. • Package contents and prices are based on availability and are subject to change due to weather and market conditions. • Returns will only be accepted if flowers arrive in poor condition. Returns will not be accepted for circumstances resulting from negligence. Boutonnières and Corsages are shipped directly from our farms to your doorstep. Before shipping your flowers, we prepare them for their journey with proper hydration methods. If your flowers appear sleepy and thirsty after thier journey, it is absolutely NORMAL. Just follow these simple steps to ensure your flowers have proper care. Your flowers will arrive with water tubes. Inspect that each tube has water, if not, fill each tube with fresh and clean water. Holding the water tube in one hand, gently pull back the soft plastic top of the water tube. Do not remove the arrangement from the plastic top. In one hand you will be holding the water tube, and in the other hand, the arrangement with the plastic top still attached.Remove the cotton wrap around the flower stems and fill the water tube with fresh water. Place the arrangement back in the tube and seal it. Do not at any time push, pull, or apply pressure to the flower arrangement. Doing so may potentially damage the flowers. Place the boutonnières and corsages in a refrigerator away from fruits and vegetables. Fruits and vegetables release gases which may damage your flowers. Also ensure that the refrigerator’s temperature is above 40 degrees Fahrenheit. Freezing temperatures will damage your flowers. Keep flowers away from direct sunlight, drafts or excessive temperatures. When ready to use, simply cut the stems at the desired length and wear.